I think many a whiskey fan has thought to themselves,"This is such a nice looking bottle, I wish there was something I could do with it rather than throw it in the recycling." I know I've had this thought many times, particularly when it comes to eye-catching bottle designs (Willett Pot Still) or those rare and amazing bottles of whiskey that I wanted to somehow commemorate. Certainly I've seen this particular craft dozens of times. I had a neighbor a few years back that threw some Christmas lights inside a wine bottle. I've seen those glass bricks decorated and stuffed with Christmas lights. This is really no different than these other projects, and quite frankly the idea of them never appealed to me a whole lot. However, two factors came into play that motivated me to try it myself. First, I like the look with the frosted glass. It's not as though it's that creative or unique. I had just never seen "bottle lamps" with the frosted glass. Second, I happened to have a decent cache of empty bottles at the moment, having been saving them for a crafty (in the literal sense) woman in my neighborhood. 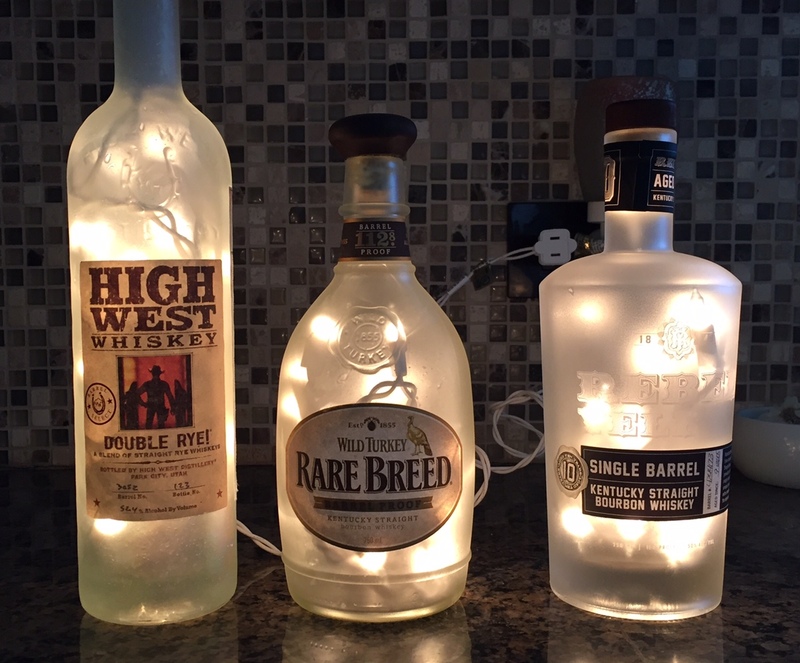 The supplies seemed simple enough and cheap enough: (1) an empty bottle (I say cheap because I'm drinking the bourbon anyway, so this doesn't really factor into cost); (2) a strand of 20 Christmas lights; (3) a 1/2" glass drill bit; and (4) some glass frost spray paint. I honestly didn't realize this frost spray paint even existed, but it was easy to find at home depot. And the instructions are simple enough as well. Drill a hole in the back of the bottle big enough to feed the strand of lights through, feed said strand of lights through the hole, spray paint the bottle with the frost stuff, let it dry and then plug in the magic! I did not realize how slowly a glass drill bit does its work, though. The instructions I had seen (an informal post on Facebook) indicated it could take 5 minutes to drill the hole, but I found it was 10-15 minutes of drilling to get the job done. I also learned the hard way that I needed to widen the hole once I finally made it through the thick glass of the bourbon bottles. With the first bottle I did, I forced the strand of lights through too small a hole, breaking a few bulbs and having to cut the cord to pull the broken strand through the top of the bottle. Lesson learned. All in all, my first few attempts were a success. My wife hates these things, but I gave one away to my neighbor, and his wife loved it. So, these lamps are getting mixed results thus far. In any event, those nicer bottles that I don't want to just simply toss in the recycling bin will now have a purpose, and my friends will all start receiving cheap, Etsy-esque gifts that they can use to set the mood with their wives (assuming, of course, that their wives are not nearly as turned off by these as mine is).